Disney in Pictures -- Pooh, Piglet, Tigger, and all the rest! Hello everyone, and welcome to this week’s installment of Disney In Pictures, the weekly series that invites you to share in all the fun! This week, we are looking at our friends from the 100 Acre Wood, or if you prefer, the Pooh characters! 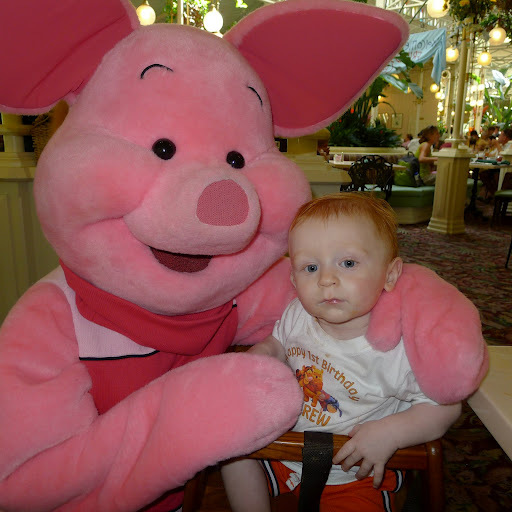 I put the call out, and you responded, sharing your favorite photos from the Disney Parks that involved Pooh, Piglet, Tigger, and all the rest of your favorite Winnie the Pooh characters! So, without further ado, let’s get started! I have had my photo taken with Tigger since 1978. Sigh, he is a rock-star among the characters . . .
Hi there. I’ve never submitted before, but this theme got me moving. This was my son’s, Andrew’s, 1st birthday at the Crystal Palace. He had absolutely no fear & was memorized! And despite how much he’s grown, this remains one of my all time favorite pics! Here is one of my favorite pictures from Hayley’s first Disney trip in 2008. She was 2 years old, and Pooh’s Playful Spot was a great place for her to just run and play. I actually think she would have spent an entire day just running from honey pot to honey pot! 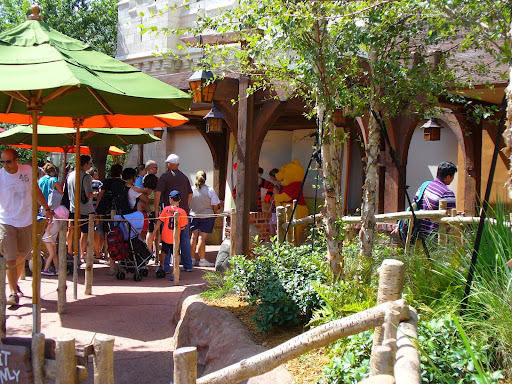 Here’s a snapshot of the new Pooh & Tigger meet and greet. I didn’t wait in line to get up close. The line was pretty long. I’d forgotten about seeing Christopher Robin with Tigger one day! This was taken in 2008. Haven’t seen him since. We have always had a love for the silly ole bear that’s stuffed with fluff! When hubby and I met 13 yrs ago I took him a small Winnie the Pooh and that bear has been taken to sea on the USS Pennsylvania, USS Rhode Island and currently serves on board the USS Florida! He has almost as many years in the Navy as my husband does. We talked about our nurseries and coincidentally we both had Winnie the Pooh nurseries as a baby and even the same Winnie the Pooh high chair. So we knew when we had our daughter we had to do a Winnie the Pooh nursery for her. So that started her obsession with Pooh bear. Her first trip to WDW she was 2 *just like I was* and was excited to see Pooh bear. Well in the photos you can see she wasn’t so sure of him because he was larger than her Pooh pillow she slept with and he moved. He was the very first character interaction she had on her trip. She never warmed up to him enough to be put down for pictures alone but she got a little more comfortable with Eeyore then wanted to walk to Tigger for his autograph. The other photos are of me *yes they are Polaroids* at the same age on my first trip in 1976 with Pooh and Tigger. Since that first trip with her she has to find Pooh and friends for pictures or if nothing else but a quick hug. Hi Mike, what a lovely topic for this week’s Disney in Pictures. I immediately thought of this first photo of my daughter in front of (well inside of) the Many Adventures of Winnie the Pooh attraction in Magic Kingdom. The queue begins and brings the story to life! It makes you feel all cute, cuddly and fuzzy like the Pooh Bear himself. Which brings me to the next picture of us meeting Winnie the Pooh at Disney’s Hollywood Studios, inside theMagic of Animation building. Our family was the first ones in line to meet Winnie the Pooh and we loved his bear hugs!! Finally, a photo of the scene set up for the Meet and Greet, I love how Piglet is stuck in the beehive and the classic spelling of “Tael” and 100 “Aker” woods off to the side. You can’t help but smile. Breakfast at 1900 Park Fare in the Grand Floridian. Special because my big kids still love getting their pictures made with his/her favorite little kid characters and they all look happy! This shot was taken during Star Wars Weekend when the Disney characters really act like characters! 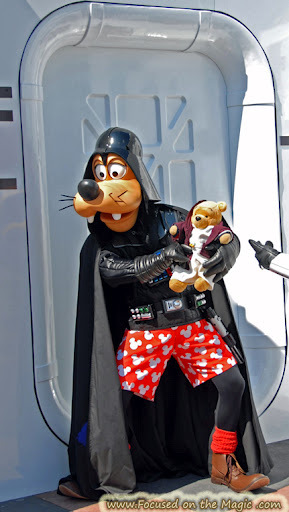 Here’s Darth Goofy capturing a little Sorcerer Pooh from the crowd and attempting to leave through the space portal. Donald came to the rescue to save poor little Pooh from Darth Goofy. We love SWW’s and the character antics that go on all weekend. Proud member of The Magical Blogorail and Disney Parks InsidEARS. Thanks everyone for stopping by, and to all of you that submitted your photos! The photo from Denny of Christopher Robin is one that I haven’t seen very often, and it gave me a great idea for next week’s theme. Stay tuned for the announcement on that later on in the week! In the meantime, don’t forget that we’ve got a great contest starting tomorrow, click on the link to learn more! 30 Things To Do At Disney World: The Many Adventures of Winnie The Pooh! Disney Dining Review: The Crystal Palace! Thanks for sharing all the great photos, Mike! We are considering our ADRs for our next trip (16 days until we can make dining reservations!!). Crystal Palace is at the top of the list, and seeing all these photos makes me very excited to experience it again! And, I haven't seen Darby with Pooh in forever! Joey and Hayley used to love Darby! Great photos from everyone! Thanks, Beth! They are all great photos, I'm glad you participated! We love the Crystal Palace, we ate there in June! Previous Post: Thank God for Rainbows at Walt Disney World! Next Post: Who wants to win a Disney Dooney & Bourke Wristlet?